This week the negotiations over the Paris Rulebook and Paris Agreement Work Programme (PAWP) recommence in Bangkok. It reminds me of the 2009 Bangkok intersessional, in the run up to the Copenhagen Conference of the Parties (COP), where there was much expectation in the air and great mobilisations on the streets. Back then, the US and big developing countries including China and India crafted the Copenhagen Declaration, which demolished the Kyoto architecture of binding commitments to emissions reductions, as well as the essential differences between the climate actions that should be taken by Annex 1 (developed countries) and non-Annex 1 countries. Although the Declaration aimed to limit global temperature increases, it ignored the need for immediate action to avert the looming climate and humanitarian crises. The negotiations were extremely non-transparent, and oblivious to the human rights framework that would be needed in order to safeguard vulnerable communities from the impacts of climate change. Governments refused to listen to the voices of their own people, and the global peoples’ movements were ignored. This framework then paved the way for the Paris Agreement in 2015. So where do we find ourselves on this return trip to Bangkok, nine years later? We are worse off than where we started. Setting us on a pathway to climate chaos, the negotiations under the Paris Agreement have been captured by the corporations. The Paris Agreement has let developed countries off the hook, both from their historical responsibilities for climate change, and from meeting binding commitments under the Kyoto Protocol. Big developing countries such as China are also using this Agreement to continue to produce dirty energy and to maintain their low emissions reductions targets. Adding it all together, the emissions reductions targets from countries’ Nationally Determined Contributions (NDCs) average closer to 4 degrees of warming, and which is nowhere near 2, let alone 1.5 degrees. In reality, the impacts of climate change are increasingly visible, and are being felt by vulnerable, frontline communities across the globe, but particularly in the poorest countries and small island nations. To protect these communities, climate finance is an urgent necessity. But the mythical 100 billion dollars commitment from developed countries is yet to materialise, with no progress towards paying for the loss and damage that climate change causes. The nature of the 100 billion commitment is also pretty vague, with negotiations reflecting an increasing mix of equity, loans and blended finance. As the Bangkok intersessional gets underway, the negotiations are not moving, and the political leadership has failed to listen to the peoples’ solutions. We are not only facing a backtracking on commitments to cut emissions at source and to take responsibility for historical emissions through providing climate finance, but we are also facing the even scarier possibility of the climate crisis being addressed through geoengineering and technological fixes, and market-based solutions that further commodify and financialise life on the planet. The clock is ticking. 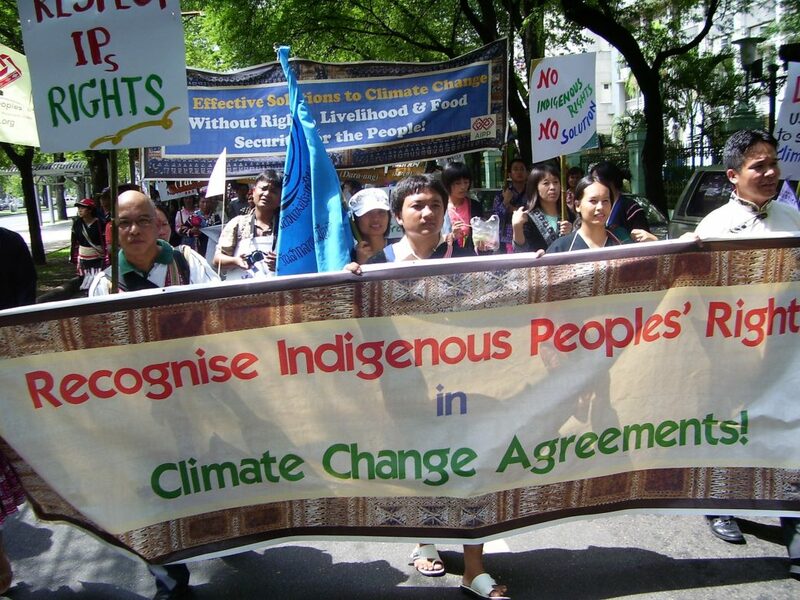 It is urgent that big emitters and polluters are held accountable, and that the voices of communities, Indigenous Peoples, women and young people are heard in the corridors of the UNFCCC. Let’s push community-led solutions forward, to reclaim the space for climate justice. After all, in whose interests are the negotiations?